By combining Granuleworks’ DEM (Discrete Element Method) and Particleworks’ MPS, you can simulate the motion of powder particles in fluids. The definition of motion by forced displacement that can be set by Particleworks alone. 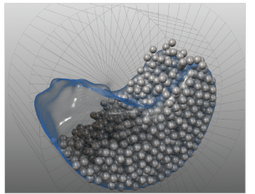 By combining Particleworks with RecurDyn, a Multi Body Dynamics Simulation software of FunctionBay, Inc., it is possible to simulate the fluid behavior in consideration of the motion of the mechanism according to reality. Sending the mechanical model behavior (position and velocity information) calculated by RecurDyn to Particleworks, and returning the fluid simulation results (fluid force) from Particleworks back to RecurDyn, realizes a bidirectional coupling analysis of both motion and fluid. 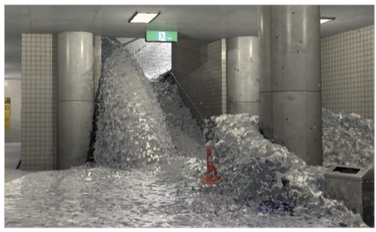 Simulating the behavior of a vehicle while running through a flood, the splashing of water around the vehicle, and the penetration of water into the vehicle interior. Ver. 6.2 makes the bidirectional coupling analysis with RecurDyn rigid bodies as well as flexible bodies possible for the first time. Deformation calculated by RecurDyn F-Flex (nonlinear flexible body) and R-Flex (linear flexible body) are also reflected in Particleworks' polygon wall’s shape in real time. Simultaneously, RecurDyn calculates deformation, dynamic stress and the strain of the flexible body under fluid force calculated by Particleworks. Particleworks can export result data to external tools such as Abaqus, ANSYS, NX Nastran, and LS-DYNA. Time-series data regarding physical quantities on each particle can be exported to CSV files, and then converted to various data formats such as NX Nastran PLOAD4. E.g. 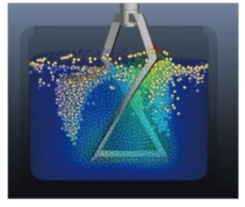 when evaluating deformation and fatigue durability of fuel tanks and baffle plates by sloshing, Particleworks calculates the behavior of fuel and the pressure distribution applied to the inner wall of the tank, while NX Nastran adds the pressure load, and executes a linear analysis or a transient response analysis to evaluate displacements, strains, stress, fatigue among others. Using flow data of particles, Particleworks can now export heat convection coefficients, which can be applied to analyze the cooling of cylinder heads, motors or sheet steel. This function uses the heat transfer coefficient to model the heat flux to the wall, and then it estimates the heat removal (heating) amount of the polygon wall surface. Cases where the temperature of the fluid is constant and a boundary layer exists can be simulated. Third-party programs such as LS-DYNA® can perform heat analysis by using heat convection coefficients exported from Particleworks. Particleworks makes it possible to calculate the heat transfer coefficient taking into account the behavior of the cooling oil and the local oil distribution (oil coating thickness). By coupling Particleworks with JMAG, the motor performance considering the temperature dependence and demagnetization of electromagnetic properties can be predicted. Prometech's rendering services can also be relied on as an option to evaluate and visualize the result calculated by Particleworks more realistically.